Cinnamon has been a well-known and beloved spice for centuries as it adds the most delicious flavour to a dish. It can be used in multiple dishes and is a spice that can be found in every kitchen around the world. Cinnamon is known to help with anti-clotting, anti-microbial activity, blood sugar control, infertility and its scent is known to improve brain function. Cinnamon being warm is able to improve the blood flow in the pelvis and is also capable of increasing the sperm count of a man. For women, PCOS is one of the most common causes of infertility as cysts grow in the ovaries, thus resulting in low fertility and irregular menstrual cycles. Cinnamon boosts fertility in women as it deals with uterine fibroids, PCOS (Polycystic Ovary Syndrome), improving weight loss and even helping to regulate normal menstrual flow. You can sprinkle some freshly ground cinnamon onto your food every morning, or you can take a daily dose of honey and cinnamon to conceive. Other foods such as whole milk have great benefits for fertility, so a cinnamon and milk fertility treatment are beneficial for those who like to add milk in their diet; you can even turn it into cinnamon ice cream and make it a delicious treat that also acts as medication for your infertility. 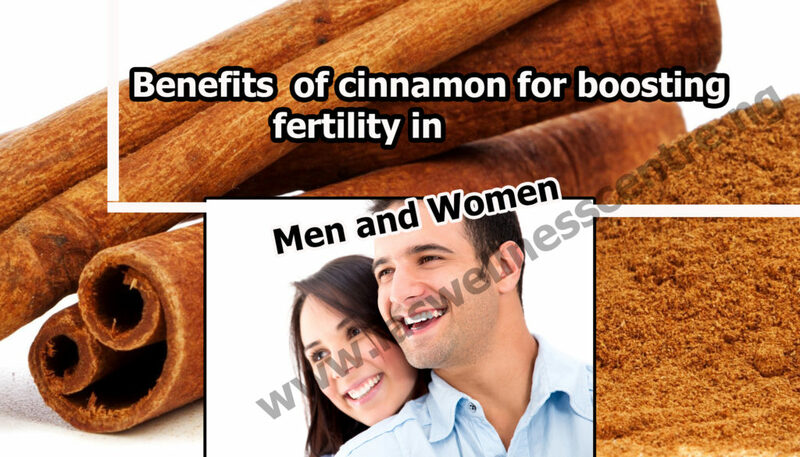 Below are some precautions to keep in mind while taking cinnamon for fertility. Cinnamon should not be had with candy, mints or gum as it may cause inflammation and can cause ulcers in the oral cavity, leading all the way down the throat. As we have seen, cinnamon is not just a delicious spice, but it has amazing benefits to one’s health. While cinnamon is mainly responsible for regulating normal menstrual cycles, it also helps in fighting the various reasons which are responsible for causing infertility in women such as type 2 diabetes, polycystic ovarian syndrome, glucose intolerance and endometrial cancer. So, How Can I.A.& S. Wellness Centre Help Me Solve My Infertility Problem? This entry was posted in Health articles, Health tips. Bookmark the permalink.